While there is more to witchcraft than just casting spells, it’s hard to deny that spellcraft still plays a key part and is often how many of us start out in the magickal arts. But like most aspects of witchcraft, spellcraft is not easy. Lighting a thousand candles and reciting just as many beautifully rhyming words will not, in themselves, get the job done. It takes concerted and consistent effort to develop, hone, and maintain the skills and abilities that are necessary to make the magick go. Yet the ability to work effective magick is there for us all, and by making simple changes in your approach, you can create deep and lasting changes within your life. 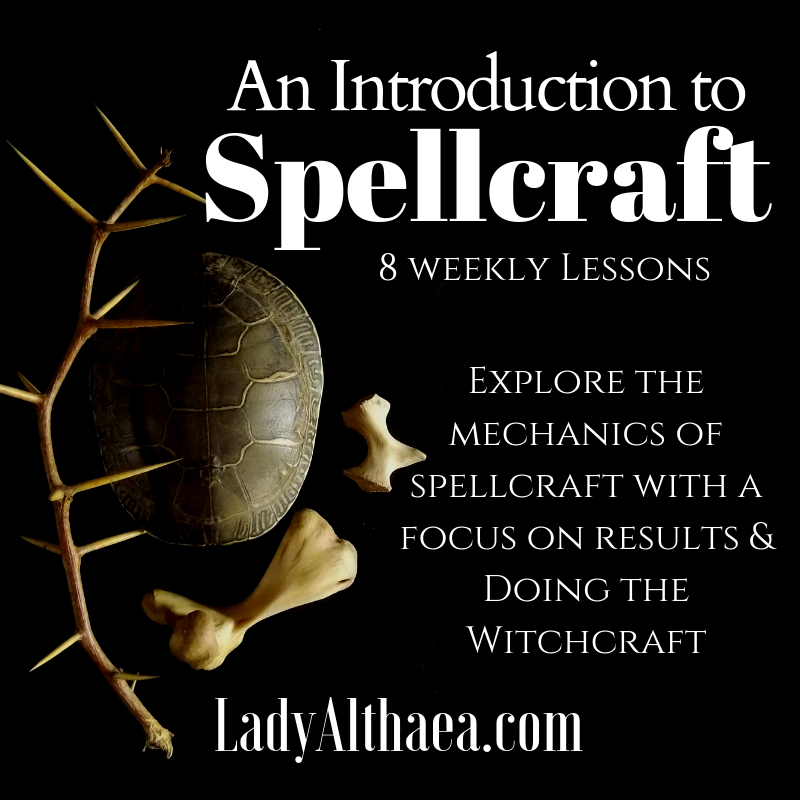 Through 8 weekly lessons with real-time weekly chats, you will develop a deeper understanding of the art of spellcraft so you can devise an effective plan of action for your magickal goals. Each week we will dig into a facet of spellcraft mechanics, using a variety of spellcrafting techniques to broaden your experience, enable you to become more innovative with your magick, and to begin seeing stronger results within your magickal practice. We will also cover practical ways to boost efficacy as well as common mistakes to avoid. As an introductory course, this course is designed with the beginner and intermediate witch in mind. However, to get the full benefit of this course, it is advised that you have some familiarity with magick, on both a conceptual and practical level, and with witchcraft, at least on a conceptual level. Neither the basics of magick nor witchcraft will be covered although their distinctions and differences will be discussed. This course is conducted through email and optional, but recommended, live weekly text chats via discord. Upon enrolling, you will receive a Welcome Message with further details of what to expect and how to access the chats. There are no additional materials to purchase for the course, however, there is a heavy emphasis on actually casting spells and working magick so as to provide you an intense experience that will give you strong direction in your personal practice.